Preheat the oven to 350°F. Line an 8x8-inch baking pan with a long sheet of parchment paper, allowing for 2-inch overhang on each side. 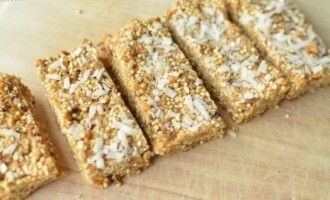 Spread oats and coconut on a large rimmed baking sheet. Bake until just golden brown, about 10 minutes. Let cool slightly. In a large bowl, stir together cooled toasted oats and coconut, dried fruit, walnuts and oat flour. In a small bowl, stir together applesauce, honey and vanilla until evenly blended. Stir applesauce mixture into oat mixture until combined. Spread mixture in the prepared baking pan, pressing down to compact. Bake 30 minutes or until golden brown. Cool completely and cut into bars. Store the bars in an airtight container for up to 1 week..